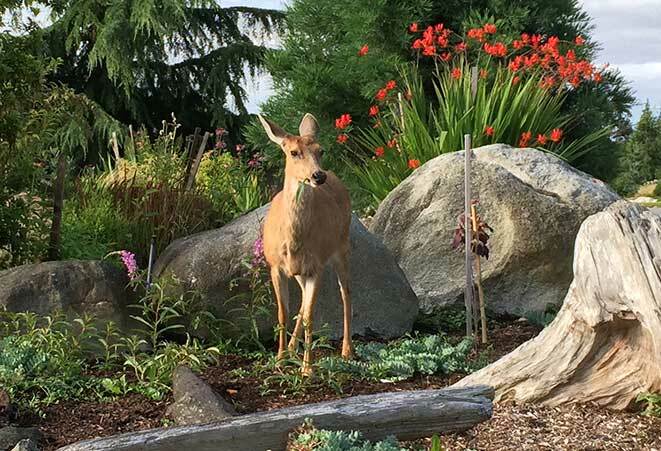 Anyone who has experienced deer browsing in their garden knows the frustration of seeing valuable plants become a buffet for these hungry animals. Deer have become much more comfortable living alongside humans over the years, and many gardens provide an appealing source of food. Deer are creatures of habit and once they feel comfortable in an area, they are likely to keep returning. If they feel secure enough, some may bed down or even hide their young in your garden! Although fencing can be costly initially, creating a physical barrier that keeps animals out of your garden altogether is one of the best methods of protecting your valuable plants. 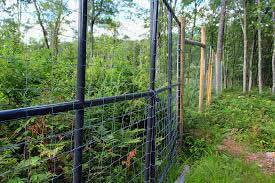 There are many types of deer fencing available at a variety of price points. Heavy gauge fencing will last longer than the lighter gauges and will be more effective overall. Some brands of polyethylene fencing offer UV protection, which will extend its life. Deer have the ability to jump quite high, so a fence height of at least 7.5 feet is recommended. Most motion-activated sprinklers are attached to a hose and the sprinkler stream is activated when motion is detected. These devices are effective against not only deer, but a wide variety of other animals. Many have adjustable sensitivity settings. Your family pet will can as a deer deterrent. Barking, as well as the dog's scent will have deer looking elsewhere to feed. Deer are hard-wired to view dogs as predators and will avoid areas where they are present. Many deer repellents are designed to trigger the animal's fight or flight response. This is typically done through odors that the animals associate with predator activity. There are many deer repellents available at a wide variety of price points, with the higher priced products typically offering better results. Plantskydd Animal Repellent is an OMRI listed Organic product, which is the #1 choice of professional growers. It lasts longer than other brands, so does not require constant reapplication after rainfall and irrigation. It is available in 3 forms – liquid, powder concentrate and granular. Plantskydd was developed in Sweden for the forestry sector, where they needed a product that would last 6 months over winter. It also acts as a fertilizer (12 Nitrogen), which results in bigger, healthier plants. It’s available at thousands of independent garden centers as well as online at www.plantskydd.com.